Kitchen! Kitchen! 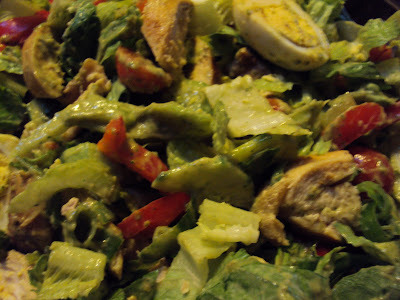 : chicken salad...green with envy!! !.......at kitchen! kitchen! chicken salad...green with envy!! !.......at kitchen! kitchen! A light, scrumptious salad that is "GREEN with ENVY"
A lovely side dish to serve this summer. ...for the greens....(or whatever you have on hand)..this salad is not fussy. Combine all in a large bowl with 2 tablespoons of extra virgin olive oil. Add the "creamy avocado" dressing and toss to coat and sprinkle some chopped green onions. For "Creamy Avocado" dressing recipe - please see previous posting of " Tilapia & Chipotle" posting on 6/8/11 and adjust the recipe to serving size. Tilapia & chipotle.......at kitchen! kitchen!